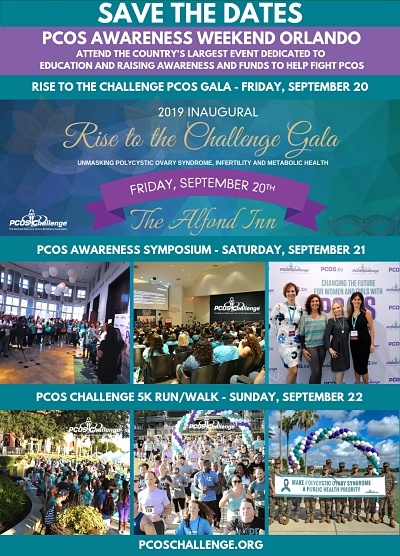 The contents of this and all other PCOS Challenge, Inc. (“PCOS Challenge”) Web sites (“Web sites”), such as text, graphics, images, and other material contained on the Web sites (“Content”) are for informational purposes only. The Content is not intended to be a substitute for professional medical advice, diagnosis, or treatment. Always seek the advice of your physician or other qualified health provider with any questions you may have regarding a medical condition. Never disregard professional medical advice or delay in seeking it because of something you have read on the Web sites! If you think you may have a medical emergency, call your doctor or 911 immediately. PCOS Challenge does not recommend or endorse any specific tests, physicians, products, procedures, opinions, or other information that may be mentioned on the Web sites. Reliance on any information provided by PCOS Challenge, PCOS Challenge employees, others appearing on the Web sites at the invitation of PCOS Challenge, or other visitors to the Web sites is solely at your own risk. The Web sites and Content are provided on an “as is” basis. All events, materials, and publications, including but not limited to radio shows, television shows, seminars, teleseminars, webinars, books, e-books, audio books, CDs, video presentations, newsletters, and advertisements, accessed through the Web sites are designed to educate and provide general information regarding the subject matter covered. They are offered and/or sold with the understanding that the website publisher is not engaged in rendering legal, financial, medical, or other professional services. Each situation is different and advice should be tailored to an individual’s particular circumstance. For this reason, the user is strongly encouraged to consult with her own physician regarding that individual’s specific situation. The website publisher specifically disclaims any implied warranties of merchantability or fitness for any particular purpose and shall in no event be liable for any loss or profit or other commercial damage, including but not limited to special, incidental, consequential, or other damages incurred as a result of specific planning decisions made by the user. Any third party web sites, including affiliates, which may be accessed through the Web sites are the sole responsibility of the third party who is posting the website. the PCOS Challenge Site makes no warranty as to the accuracy of any information on third party web sites and accepts no liability for any claims, errors, and omissions or for any damage or injury to persons or property arising out of the use or operation of any materials, instructions, methods or ideas contained on such web sites. Any offers, pricing, and/or promotions offered through the Web sites, affiliates, or any third party are subject change without notice at the sole discretion of the party making the offer.